How the fight over Australia Day mirrors America’s Confederate statues controversy. How another country grapples with commemorating the ugly parts of its history. A protester speaks during a protest organized by Aboriginal rights activists on Australia Day in Melbourne on Jan. 26. The protests are part of a growing movement in Australia—mirroring the recent efforts to topple Confederate monuments in the United States—to stop celebrating the 26th day of the year. Of course, it’s not the beer and cricket that are objectionable but the controversial history the holiday commemorates. It’s not exactly a proud moment in our history—about as proud as a treasonous war fought in order to preserve the right to own human beings. Yet Australians continue to memorialize this history with beers and sausages, as Americans memorialize theirs with metal and stone. At the heart of both lie an unwillingness to confront the sins of the nation, by two countries that prefer to see themselves as moral arbiters and civilizing forces. More and more Australians and Americans are recognizing and calling out such symbolism. 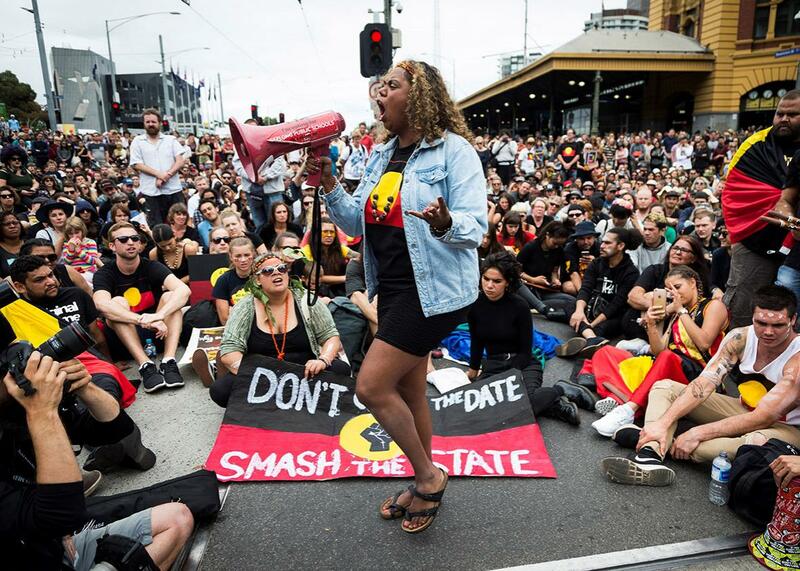 The #ChangeTheDate protests get larger each year, with over around 50,000 protesters showing up to an Invasion Day rally in my home city of Melbourne this year. Suggested replacements include May 8 (“maaaate”), but any date that doesn’t represent white colonization will do. Last week, as American protesters tore down statues of Robert E. Lee and Roger B. Taney, Yarra Council, one of Melbourne’s inner-city councils, voted to move its Australia Day 2018 celebrations to another date. The Murdoch-owned paper the Australian condescendingly headlined this, “Trendy Council to Dump Australia Day.” It was followed Monday by another Melbourne council, which voted to acknowledge that Jan. 26 marks the beginning of an invasion and to cease referring to it as Australia Day. National broadcaster Triple J, whose millennial audience is the most strongly in favor of change, is consulting listeners about whether to run its annual indie countdown on a different day. We still want to have Australia Day, and we still want to celebrate our country. But Jan. 26 is an inappropriate time to do it. Jan. 26 should be recognized only as a day of mourning and reflection. But the movement is still far from mainstream. In response to Yarra Council’s decision, the federal government revoked its right to hold citizenship ceremonies, and even Victoria’s popular, progressive premier called the change “unnecessary.” The majority of Aussies are not yet on board with changing the date, just as—until recently—there was no great urgency to tear down Confederate monuments in the South. There are strong parallels between these movements, and many of the arguments for and against changing our national holiday line up with those for and against removing Confederate statues. The argument that Confederate statues are merely about Southern pride is mirrored in a belief that Australia Day is only about Aussie pride—the good stuff, not the bad. Pride in country, pride in region is not a bad thing, after all, and there is much to be celebrated about being Australian. Today’s Australia Day, many argue, is about modern Australia, unconnected to the historical event it commemorates. In fact only 43 percent of Australians can even tell you what it commemorates. But Jan. 26 isn’t an arbitrary date—it was chosen to commemorate the British influx. It celebrates a specifically white Australian identity. For decades, indigenous Australians were forced to take part in reenactments at Sydney Cove. Arguing that Australia Day is just a day is like arguing that Confederate monuments are just historical artifacts, divorced from the white supremacy they stand for. They are not. As with the argument that removing the Confederate statues is “erasing history,” some might also say that Australia Day merely tells the story. But what great lessons are being imparted by partying on what should be a day of mourning? What example is set by tacitly condoning white supremacy and cruelty? Stronger reminders will be felt by leaving the marker of an empty platform (for you) and holding an annual day of recognition and reparations (for us). Moving the statues to a museum and the party to another day don’t mean forgetting what happened. And as if we could. Indigenous Australians still face major inequality: shorter life expectancies, higher rates of infant mortality, poorer health, and lower levels of education and employment, not to mention higher rates of violence, mental health issues, and incarceration. Research suggests that “‘intergenerational trauma’ resulting from the ongoing and cumulative effects of colonization, loss of land, language and culture, the erosion of cultural and spiritual identity, forced removal of children, and racism and discrimination” is part of the underlying cause. With all this in mind, it’s no wonder the date this trauma began is a “Day of Mourning” for indigenous people, just as Thanksgiving—another day where pain is obscured by celebration—is for many Native Americans. Less than a quarter of the indigenous population feel positively about Australia Day, and they lead the #ChangeTheDate protests. That’s not to say all who oppose the changing the date are motivated by racism; Australians are an apathetic lot. But apathy is still rooted in an acceptance of white supremacy; denial is a direct repudiation of the truth. And obviously, some are proud of such history. (You only have to look at the comments of any article about changing the date to see Australians claiming that indigenous people led terrible lives before white people arrived and that they have brought all their problems upon themselves.) Australia’s reluctance to change the date is strong, but if passions continue to rise, a clash along the lines of what Americans witnessed in Charlottesville, Virginia, this month is quite possible. Maybe this will open our eyes. We Australians who support moving the date are not trying to “change history,” as President Trump might say, nor can we. We are attempting to reconfigure the way we see it and the way we present it to generations ahead. Australia, like America, will always be a nation born from genocide, just as America was built by slaves. The least we can do is condemn it. The very least we can do is not celebrate it.